There’s lots of different ways to facilitate meetings, and here we share a few ideas. Meetings have diferent stages, and a well-facilitated discussion tries to go beyond ‘business as usual; read more about this and participatory decision-making here. Some years back we published a blog post about what to do at the beginning of a meeting, but unlike when we facilitate, we forgot the middle and the end! So here’s the middle, and in about 10 days we’ll bring you the end. In my last blog, I talked about the value of absorbing the ways that different tasks are handled by the various methods that have been approached, because you can often adapt these to your own purposes, knowing that they are tried and tested. Last time I suggested a couple of approaches for the start of an event. Here are a couple of suggestions for the heart of an event, where you are often debating possibilities (possible strategies, actions or whatever) and moving towards a decision. I’ll start with how you can make sure you get a variety of perspectives on a topic. 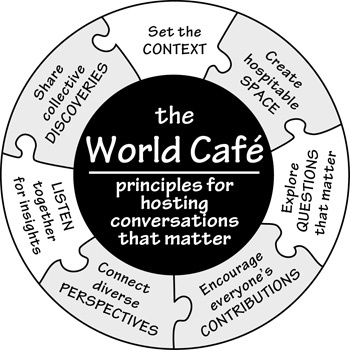 World Café often has three rounds. In the first round, small groups discuss the topic, usually sitting around small tables. The tables are usually covered with paper tablecloths, on which people are encouraged to scribble. In the second round, every member of each group goes off to another table, bar one person. That person explains her colleagues thoughts from round one to the new people, and records their views. In the third and final round, everyone who moved in round two comes back to their original table, where the insights they bring back with them are combined with the ideas of the round two visitors. A really solid way of deciding a way forward is provided by an approach called Appreciative Inquiry (AI). ‘Inquiry’ means that questions are used to focus people’s attention. ‘Appreciative’ means that the questions asked are about when things have gone well, or at least about making the best of a difficult situation. This is often a refreshing approach, a contrast to the usual emphasis on problems. We once asked people with high‑functioning autism and their carers, ‘What’s the best thing about being autistic?’ Not usual. The third aspect of AI is that it concentrates on stories. Many of the questions begin, ‘Can you tell me about a time when…’ This means that plans for the future are rooted in actual examples of things that have already happened: hence the solidity I referred to in the previous paragraph. These plans take the form of a series of aims which are referred to as ‘provocative propositions’. One way in which they are provocative is that they are goals for the future, written as if they were already happening. They are tested for both desirability and feasibility, which makes them both a stretch and realistic. One of my favourite quotes is about films, from Jean Luc Godard I believe. A film, he said, has a beginning, a middle and an end, but not necessarily in that order. Most events and meetings, fortunately, do have that order. Next time I’ll say something about the end, when you work out what you are actually going to do, and evaluate how the meeting went.